The Tag Heuer Grand Carrera Calibre 36 RS Caliper Automatic Chronograph 43 mm Men’s Watch CAV5185.FC6237 is among the most prestigious of this company’s designs, and offers highly innovative technical features. If you are in the market for a striking, luxury timepiece that is sporty and offers several different high-tech timekeeping and stopwatch features, this may be your fantasy come true. Inspired by GT race car engine design, this timepiece replaces traditional sub-dials with rotating dashboard-style discs and fixed red pointers. The effect is definitely high-tech and automotive, but stylish. This watch is also the world’s first mechanical chronograph, which measures and displays time to 1/10th of a second. 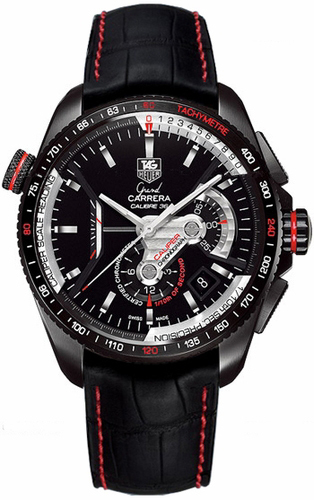 In addition, it features a tachymeter, which provides average speed measurement. Racing or driving fans should love it, as well as anyone who enjoys gadgetry and the latest high-tech features. The 3 rotating chronographs are positioned as follows: At the 3 o’clock position is the 30-minute sub dial. At 6 o’clock is the 12-hour sub-dial. At 9 o’clock is the caliper – 1/10th of a second sub-dial, magnified for easy readability. Regarding its visual style, red stitching provides an eye-catching contrast to the black texture of the alligator band. This same red is also repeated in the red pointers on the sub dials and at various points on the bezel and push buttons. The dial is black and silver-toned. Altogether, it is a handsome watch, that shows thought and design behind its visual appearance. This watch could easily be worn for everyday activities or sports. Matte black alligator strap with red stitching and underside. Black and silver PVD tachymeter scale engraved on the fixed outer bezel. Black dial with luminous, faceted steel hands and hour markers. Date window between 4 and 5 o’clock positions. Double thickness of highly scratch resistant sapphire crystal. Push-button deployment buckle, for added security. Automatic calibre 36 movement, with 31 rubies. Swiss made. Tinted double sapphire crystal case back reveals movement. 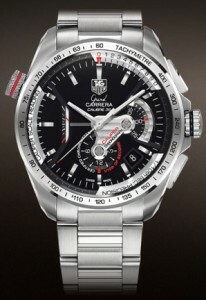 Grand Carrera Variation CAV5115-BA0902 with stainless steel case, bezel and bracelet. Drawbacks to this particular model are few, but rather obvious. The case is water resistant to 100 meters or 330 feet, but the wristband is alligator leather, which should not be immersed. Rather a conflict of interest there. The skeleton case back, which allows you to see the watch’s movement in action, is undeniably cool, but no one will ever see it with the watch on your wrist. Visibility and readability are also hindered somewhat by all of the chronograph dials, no matter how cool they look. So, whether this is the watch for you really depends on how many stopwatch features you require, if any, whether or not you want to be able to wear your watch in the water, and how much you care about having a watch that looks really cool and high-tech. This is, indeed, a high quality, high-end watch with many fine features and impeccable timekeeping ability. It is handsome and stylish. I am not certain, however, that it is suitable for formal wear, as its looks are distinctly sporty. You decide. 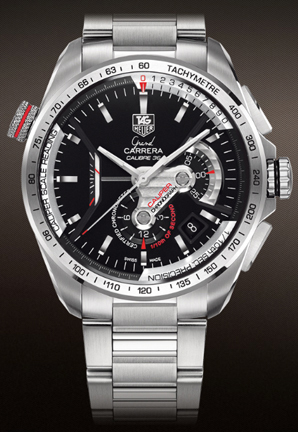 The retail price of the CAV5185.FC6237 watch is $10,500, among the highest priced of Tag Heuer’s timepieces. You are paying for the superior technical features of this watch, as well as the innovative sub-dials design and display, as well as the Tag Heuer name. If you need a watch with these features, or desire to treat yourself to a high-quality, handsome and sporty timepiece, then this could be the watch for you. Online deals can readily be found, which may lower the price by a few thousand dollars, but do make certain you are purchasing from an authorized dealer.